Ever really want to do something, but you know in your gut it isn’t right? Your reasonable side knows you shouldn’t indulge but your mind overwhelms you with the tantalizing calls of desire. It’s a known tale like the siren’s sweetly calling you out sea. This is about that human challenge, and how I, like Odysseus, tied myself to my ship’s mast with wax in my ears. I love classic style and closet staples. 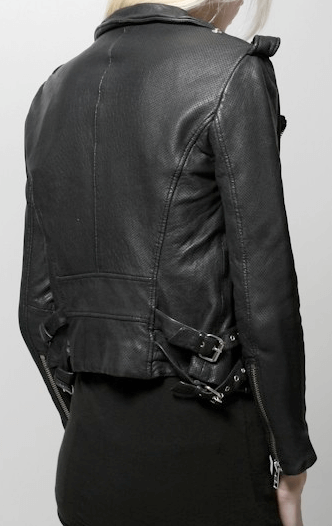 And one piece I’ve been searching for is the perfect black leather jacket. I want the perfect blend of sharp cut, just the right amount of edging timings and fits like a glove. This weekend, I went causally pursuing some local stores with a girlfriend of mine and I spotted her, the once cow that is. I instantly fell in love and as shopping with friends goes, she urged me to try it on. Oh dear, it was fabulously perfect! The stars sparkled in my eyes as I thought I had met my leather match. But I walked out of the store sans leather jacket. I kept thinking about it. The next day I returned to the store again with my mother and tried it on. Once more, the piece hugged me, and my puppy love grew stronger. Here comes the heart break. The jacket was Made in China. I did my research on the brand the night before and I have seen enough to know that no ethics alined with mine were involved in its production. My mind can be a terrible teaser. I walked out of the store again without buying it, but it truly tormented me. I knew I couldn’t trace it + by making the purchase I would be supporting the one thing I vowed not to, and break a promise with myself. Our emotional connection to fashion is one of intricate complexity. But it’s not just fashion–so many other aspects of our lives are fueled by rapid and thoughtless consumption. And without taking a stand our closets and homes become filled with the same mindless things. Fashion (and life!) should be fabulous + fun–not filled with torment. But “desire is the root of all suffering”–oh Buddha you are so spot on. I never ended up buying the jacket. I kept the promise to myself, to you and to the industry I am so passionate about and I can say proudly I’ve only made purchases I can trace with confidence. No longer am I actively searching for that perfect leather jacket + I’ve put the infamous jacket desire to rest: I’ve sailed past. And I will continue to live my values. Although the sirens never stop, especially in a culture that continuously wants you to consume the latest and greatest, we vote with our dollars and we can take a stand + be the change. Wow, good for you! That must have been heartbreaking. It really is hard to find a good–in the fashion and ethical sense–leather jacket. I bought mine in 2009 and it’s conventional. I’m assuming you’ve already look at The Sway’s jackets?